A piecewise constant approximation consists of reducing any grating profile to a finite set of uniform rectangular regions. Each region has a constant index of refraction, and each region in a layer has the same height. Adjacent regions may be assigned the same index of refraction. For example, consider the simple grating structure shown in the figure. Notice that it is not necessary to identify the substrate or superstrate. The region below the canvas is assumed to be the substrate (specified on the Parameters tab). GSolver automatically generates the piecewise constant approximation to any grating structure drawn in the unit cell. This is done when the user clicks the ‘Approximation’ button on the Grating Editor. The result for the grating shown above is shown in the figure below. 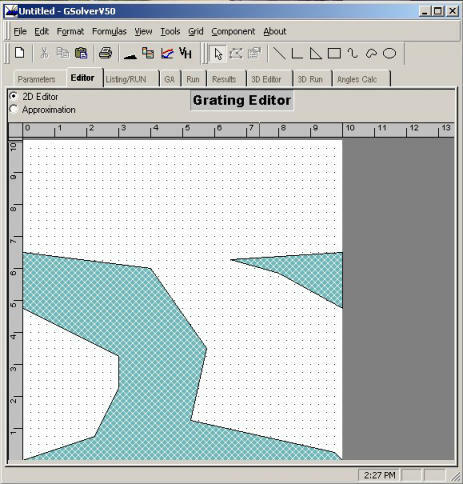 This grating view is designed to fit within the viewport, however the original dimensions as set by the units on the editor Canvas (grid of dots) are maintained in the internal representation of the grating. Arbitrarily complex grating structures may be represented in GSolver. There are no practical limitations on the number of regions or types of materials. 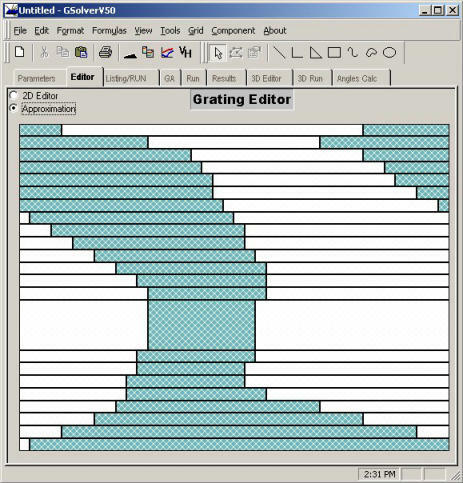 Refer to the Users Manual for additional information on the Grating Editor. Copyright 2006, 2018 Grating Solver Development Co.